The World of Park & Leisure Homes Show returns to Stoneleigh Park from 11th – 14th June, offering free entry and free parking. The UK’s biggest show for leisure lodges and residential park homes will return once again to the grounds of Stoneleigh Park in Warwickshire in June. The World of Park & Leisure Homes Show 2015 is your chance to view over 50 show homes including the launch of several new lodges and homes from the country’s leading manufacturers. Pathfinder Homes will be showcasing their Keepers Lodge, which launched earlier this year and Omar Park & Leisure Homes will be exhibiting a selection of their bestselling homes including the Heritage, the Colorado and the Accent on stand M11. There will also be homes and lodges to view from The Dream Lodge Group, Willerby Holiday Homes and Stately Albion to name a few. In addition to the display of homes, a host of suppliers will be exhibiting related products and services including decking, coatings, hot tubs, insurance, refurbishment and garages. Be sure to make a beeline for the Quick Move Properties stand – the UK’s largest property part exchange company – where the team of experts will be on hand to offer advice on all aspects of part exchange. If its spas and hot tubs that you’re interested in, stop by the Superior Spas stand to learn more about their full range of wellness products including spas, steam rooms, saunas and hot tubs. You may also benefit from speaking to the Spaeuro team who can advise on spa filters, parts and accessories. 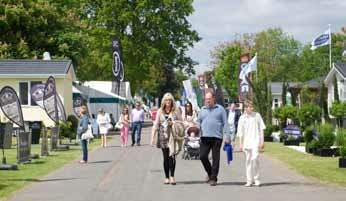 The Trade Preview Day is Thursday 11th June and the show will be open to the public Friday 12th – Sunday 14th June. Entry and parking are free and each visitor receives a complimentary show guide.